Hardware makers have figured out that enterprises are the best way to make money off of VR and AR, not consumers. NVIDIA, a company that does both things well but has been particularly strong on the business side lately, has just opened up its Holodeck "intelligent" VR platform to select designers and developers. First unveiled in May, it allows for photorealistic graphics, haptics, real-world physics and multi-user collaboration. That helps engineers and designers build and interact with photorealistic people, objects and robots in a fully simulated environment. The idea is to get new hardware prototyped in as much detail as possible before building real-world models. It also allows manufacturers to start training personnel well before hardware is market-ready. For instance, NVIDIA showed how the engineers that built the Koenigsegg supercar could explore the car "at scale and in full visual fidelity" and consult in real time on design changes. Holodeck is built on a bespoke version of Epic Games’ Unreal Engine 4 and uses NVIDIA’s VRWorks, DesignWorks and GameWorks. It requires some significant hardware, either an NVIDIA 1080, Quadro P600, NVIDIA 1080 Ti or Titan XP GPU, but the firm says it will eventually lower the bar. It’s not clear what kind of headsets are supported, but both of the major PC models (the HTC Vive and Oculus Rift) will likely work. NVIDIA is already using its Holodeck as a way to train AI agents in its Isaac Simulator, a photorealistic machine-learning environment. 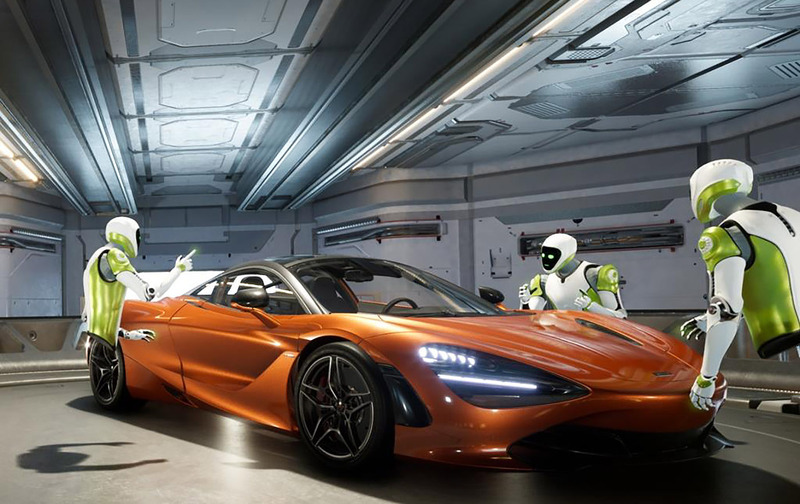 With Holodeck, NVIDIA is taking on Microsoft and its Hololens in the enterprise and design arena — though the latter AR system is more about letting engineers interact with real and virtual objects at the same time. Another player in the simulation scene is Google with Glass Enterprise, a product aimed more at training and manufacturing than design. All of this doesn’t seem like it’s going to help you game or be entertained, but there is a silver lining. Much of this very advanced tech is bound to trickle down to consumers, hopefully making VR and AR good enough to actually become popular.